TransCash offers a Dual Pack of Prepaid Money Sharing Debit Cards. This program is used to remit funds to a beneficial cardholder. Consumers are offered a reloadable prepaid card for their personal use, and a second card to support remittances. Account-2-Account transfer function is used to move money in real time between the primary and secondary card account. Consumers enroll for the Dual Pack Prepaid Money Sharing Cards, and also enroll information about their beneficiary. Each card has its own routing and account number, and the funds available on the primary card are not accessible by the secondary card. The primary cardholder can transfer money from the primary card to the secondary card at anytime, anywhere. The secondary card cannot be reloaded by itself and is limited by the funds transferred from the primary card. The limit of the prepaid debit card is determined by the amount deposited onto the card. In order to make purchases, sufficient funds must be available in the account. 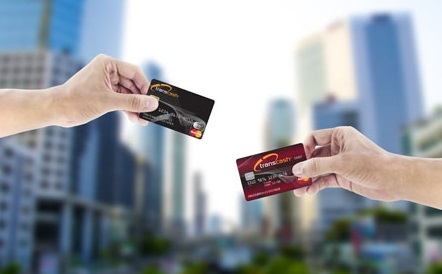 Both cards convey all rights and privileges to use the card anywhere Visa or MasterCard debit cards are accepted worldwide. This system of sharing funds represents an innovative way of money sharing that is made easier and more affordable than standard money transfer services. The TransCash patent addressed a need to simplify the methodology for funds being transferred from migrant working population who are apart from their families but still need to send money home to support their family members. Primary cardholder can request and link additional supplementary cards (up to ten) to the primary card. Each customer can have a maximum of 2 packs. Send money to loved ones conveniently!